In a public place, choose a location that is busy and well-lit. Ideally covered by CCTV. Choose a sturdy immovable object to secure the bike to, ideally a fit-for-purpose cycle stand/rack parking. Lock the bike correctly to the solid immovable object. Use only ‘Sold Secure’ approved locks. Two high-quality locks in London, or any other medium-high risk area. Remove valuables from the bike such as pumps and lights. Consider security bolts instead of quick release on wheels and the seat post. These special security bolts can be used on other parts to help prevent bike stripping. Finding somewhere to park your bike can be difficult at the best of times, but it’s vital to find the right location. If a purpose built secure cycle parking facility is not an available option, then the second option is to look for a set of public bike stands in a busy, well-lit area. Ideally the location should be covered by CCTV and with no signs of bike theft, such as lonely half remains of locked wheels/bikes or cut locks on the floor. The stand should allow you to comfortably lock the bike with correct technique to the stand. Avoid locking your bike to railings or any other objects. Not only could it be illegal and your bike might be removed by the facility or authority, but the object might have the ability to be broken, cut or unlocked by the thief. For example, you may have seen bikes locked to pavement sign poles, but these are known as ‘sucker poles’ for a reason – the sign can be easily removed and the bike lifted over the top of the pole. The most common bike stand you will see is a ‘Sheffield Stand’, which is recognisable by its staple like design. This stand should allow you to lock the frame and both wheels correctly to it. Do check the integrity of it. It has been known for them to be cut or removed slightly from their concrete base to allow the thief to slide the lock out. Avoid bike racks that only allow the tip of the front wheel to be secured to it, which are recognisable by their ‘toast holder’ design. Some of them do have a bar that stretches back to the frame to allow it to be locked, these are rare – other types should be avoided at all costs. Be wary of locking your bike in the same location day after day, if it’s publically visible. Especially if it’s obvious to the bike thief that you will be away from the bike stands for a set amount of time. Whilst it’s said that the vast majority of thieves are opportunist, some watch areas and steal to order. If you notice someone has made an attempt on your lock, don’t let them try again the next day. If your work or local facility does not have fit for purpose cycle storage, please share with them the cycle parking solutions listed here so the situation can be changed. Good bike locks and good locking technique go hand in hand. You can use the best gold rated bike lock on the market, but it will not be fit for purpose if you do not use it correctly. The following best practice image is geared towards locking your bike in London, or any medium-high risk area. 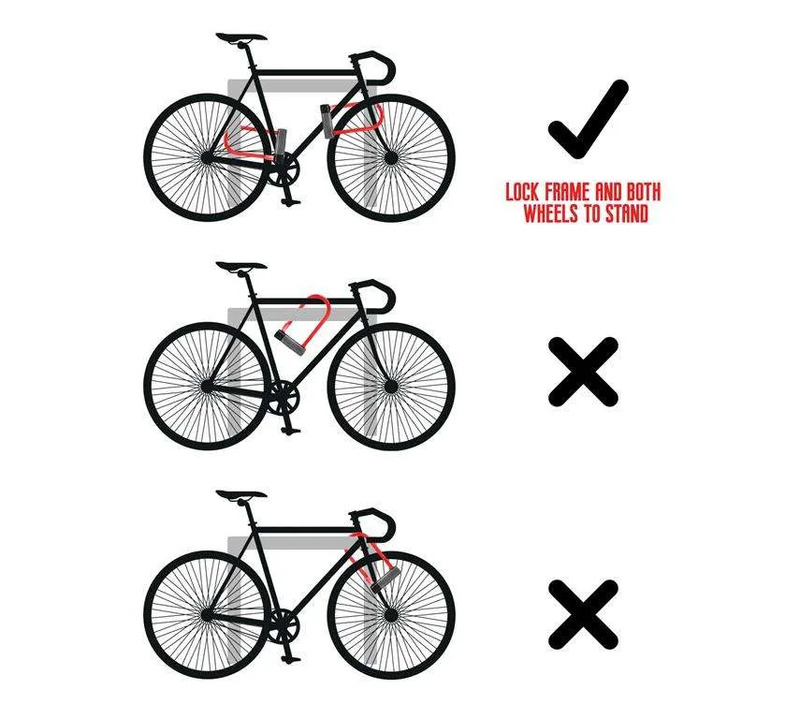 In London, use two Sold Secure gold bike locks to secure the bike to an immovable object, ensuring both wheels and frame are covered by the locking (don’t just lock the frame or front wheel). Don’t use cable locks (especially as a primary lock, regardless of the risk factor of the area/facility). If using a Sold Secure D-lock (there are other Sold Secure gold types – chain locks), the lock keyhole should be facing down. Making it as hard as possible to access the keyhole. Whilst not as vital as it used to be (lock picking used to be easier and more prevalent), use two different lock model/types (for example, a D-lock and then a chain lock). Keep the lock off the ground and try to get the tightest fit possible. This helps prevent leverage style attacks (for example, with a D-lock, the thief will then find it hard to wedge anything inside the ring/D of the lock to force it). Making it as awkward and time-consuming for a bike thief will greatly lower the risk of bike theft. If an opportunist thief looks at rack full of bikes, they will look at the ones that are the easiest wins. So if your bike is next to a more expensive bike that is secured with a cable lock, then the thief is unlikely to target yours first. Saying that, as cyclists we all have a responsibility to help fellow cyclists improve their security, so do warn others and help educate them. Consider using security bolts on the wheels, saddle and other parts. Whilst cable locks should not be used as a primary locks, they can be useful as an extra deterrent, looping through saddles and other parts. Be wary of giving away your bike details and home location when using social media or apps such as Strava (consider the ‘enhanced privacy mode’). Avoid keeping your bike in a wooden shed. If you do have to, ensure the bike is out of view (especially if there is a public footpath or other access at the back of your property and you have windows – it’s possible to put on one way privacy window film – on your shed). If you live in a flat, avoid leaving your bike in a communal hallway, even if it’s possible to lock the bike to a staircase railing or similar. Keep it inside your flat, but be wary about balconies if it could be potentially reached by a thief. If your property has a communal bike storage facility, make sure it’s fit for purpose. Have there been previous break-ins? Ask your neighbours. Ensure the bike racks are of good quality (not all racks are the same). Ask the management company to get in-contact if improvements are required.